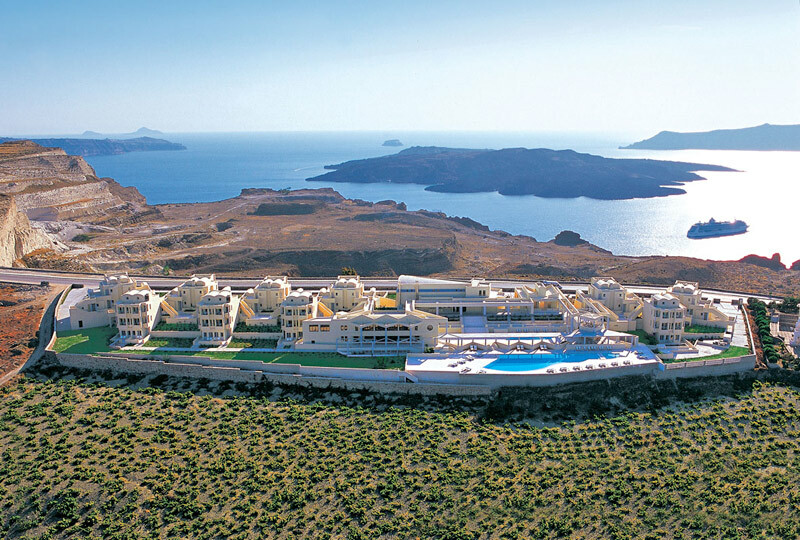 Welcome to the most prestigious 5-star Hotel on Santorini island. Overlooking the Aegean Sea, Majestic Hotel offers its guests high quality services along with the widest variety of facilities to be found on the island. From the stylish lounge bar by the pool to the elegant restaurant on the terrace, from the carefully arranged lines of the main lounge to the steamy pleasures of the Turkish Baths, the Majestic is bound to create an atmosphere of absolute luxury and relaxation. Your accommodation is taken seriously into consideration at Majestic Hotel. This is why all its 60 luxury rooms & suites enjoy a view to the sea, either Western (volcanic caldera) or Eastern (Aegean Sea). And you will not have to worry about any noise disturbing your calm, as we have built all rooms with sound proof windows and doors. This is The Majestic’s family room, standing in two levels and can facilitate up to four people. The steps lead you to the upper level, where the master bedroom stands. On the lower level you will find the sitting area with sofa beds and a luxurious bathroom. The maisonnetes view the eastern part of the island. The Luxury Master Suite of The Majestic Hotel is an exceptional type of luxury accommodation unique on the island of Santorini. It is situated in a privileged site in the Hotel and overlooks the Volcanoes. High aesthetics , space, unlimited light, top designers’ furniture from Bauhaus to contemporary design, high quality materials together with automated facilities ensure an extraordinary stay. All the three swimming pools of Majestic Hotel are equipped with Jacuzzis. they contain fresh water while one of them is heated. Do not forget to enjoy a meal at the a la carte restaurant Kapparis of Majestic Hotel and a dinner at the gourmet restaurant Krocus. And if business is the purpose of your visit to Santorini, you will find that our facilities include the Convention and Business Centers with the latest audiovisual technology. The conference centre of Majestic Hotelis can host 120-130 people, while the Majestic Hotel meeting room is for 30-40 people. You will also find a 10 person executive meeting room at this luxury hotel.